Natural wood pergolas, birch chuppahs, gazebos, natural fitting, easy to assemble. Oregon Coastal Flowers has become known for its organic rustic wedding arches. The natural feel of the arches combined with the ease of assembly/dis-assembly with no metal parts has made them very popular for use at events. Our most popular styles of these wedding arches include pergolas, chuppahs, gazebos, trellis system, free style, and numerous others. See all our event arches here. We use three different types of wood in our construction of these wedding arches. Our most used wood, alder, is a birch look-a-like with a bit of moss and lichen on it. 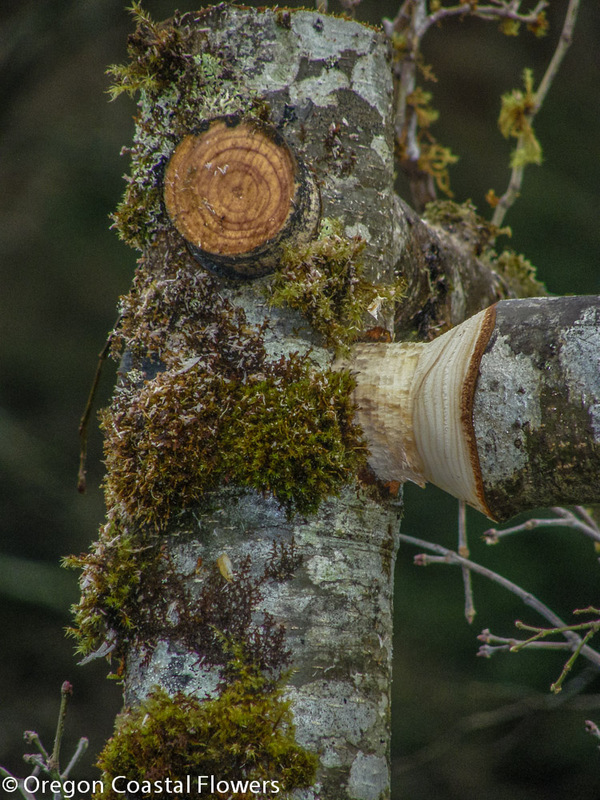 All the photos in the above gallery, what looks like birch is in fact alder. Alder is our native birch like tree here on the Oregon Coast. We responsibly harvest these trees across the river from our farm on over 250,000 acres of Oregon State Forest Land. Our next most used wood is green mossy maple branches. These are cut from very large maple trees that grow along the Kilchis River near our farm. And third, we use vine maple trees. The branches are wavy and make for an interesting arch, but are much more difficult to construct and therefore more expensive. We build many styles, but the two most popular styles of wedding arch are the pergola and the chuppah. The pergola is constructed with two side gate panels and a top. Construction with just three panels makes it extremely easy to assemble, literally taking less than a few minutes to construct (less than 30 seconds if you’re a professional like me). To the right is a photo of our rustic pergola. This particular arch is embellished with vine maple. Most brides or event planners prefer clean poles. All of our arches employ the use of tenon and mortise fittings, which is an all natural way of connecting the poles. We used to use tent fittings which worked well, but our current method creates tighter fitting joints and is all natural. See photo on left for an example of how our arches fit together. Once all the pieces are put together, they are very sturdy and do not require additional reinforcement, however, until the whole structure is connected, if not handled properly they can break or split at the joint. This can be prevented by having adequate help installing the event wedding arch. The standard size of pergola is 7′ tall, 6′ wide, and 34″ deep, but since all arches are custom built, we can build them to whatever event specs you have. The chuppah is a traditional arch style used within the Jewish community, but can be used in all types of events. It is by far our most popular arch that we build. It is made up of four upright poles and four cross pieces. We typically build them out of alder wood (birch look-a-like), but use other types of natural wood as well. The standard size is 8X8X8, but 7X7X7 is also a popular size as well as 7X7X6 or 8X8X6. Again, all arches are custom built so we can build to whatever size you need. Because all the pieces are interchangeable, some people have some shorter cross pieces built so that it takes the shape of a pergola (rectangle) and can then be used for multiple events, sometimes as a pergola and other times as a chuppah. We have event companies or wedding event designers who use our arches multiple times in the same weekend. If the arches stay dry they can last and look nice for several years. They do lose their fresh, vivid luster over time as they are freshly cut when we initially build them. View all styles of wedding arches here.